The ninth day of the month of Av falls on Shabbat this year, postponing the fast of Av to Saturday night (July 25) and Sunday (July 26). 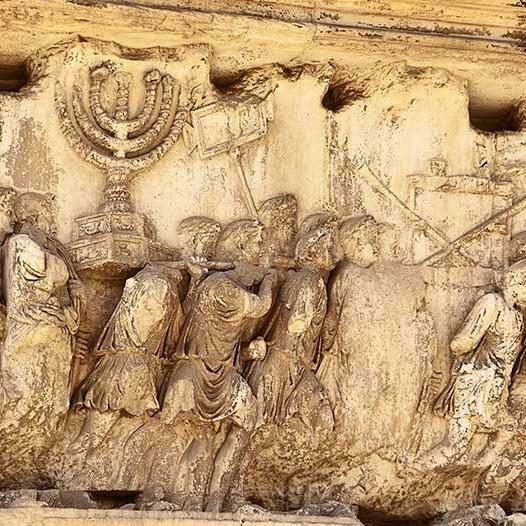 In honor of Tisha be'Av and the anniversary of the destruction of the Temple, the following excerpt from Torah Club: Chronicles of the Apostles, tells the story of that dark day. Judaism observes the ninth of Av as a fast day commemorating several calamities that came upon the nation on that day. The Bible calls it “the fast of the fifth month” (Zechariah 8:19). The Talmud indicates that the Israelites in the wilderness believed the evil report of the spies on the ninth of Av. Nebuchadnezzar and his army set fire to the Temple built by King Solomon on the ninth of Av. Titus wanted to preserve the Temple. He had his promises to Agrippa and Bernice to consider. He argued, “We should make war on men, not inanimate objects. If we can preserve the Temple, it will make a splendid ornament for the people and government of Rome.” Tiberias Alexander backed Titus in this opinion and the council adjourned. 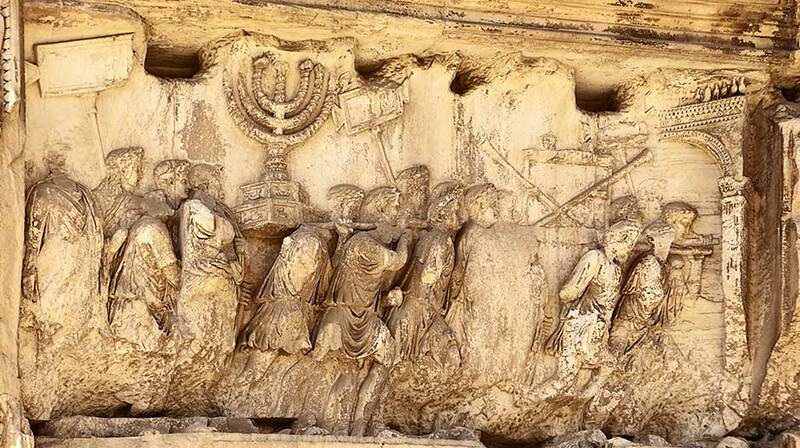 Titus ordered his men to extinguish the fires burning on the Temple Mount and prepare for the final assault. Our Master warned, “False Messiahs and false prophets will arise and will show great signs and wonders, so as to mislead, if possible, even the elect. Behold, I have told you in advance! … do not believe them” (Matthew 24:24-26). The false prophet promised the people that, if they demonstrated their faith in God by ascending to the holy place now, at the critical hour, they would surely see the Messiah come from the Mount of Olives and drive out their enemies. A great multitude of people—men, women, and children—heeded this prophecy and made their way up to the Temple Mount which, at that time, was still a war zone. Some made their way to the Temple, others took refuge from the battlefield on the roof of the Royal Stoa (the southern portico) and on the roof of the eastern colonnade (Solomon’s Portico). They looked toward the east, waiting for the deliverer to appear. Josephus says that about six thousand men, women, and children crowded onto those rooftops. Meanwhile, the war continued in the Temple’s outer courts. The Romans took control of the Court of the Gentiles. The book of Revelation alludes back to this when it says, “Leave out the court which is outside the Temple and do not measure it, for it has been given to the nations; and they will tread underfoot the holy city for forty-two months” (Revelation 11:2). As the people of Jerusalem ascended the Temple Mount to await the messianic deliverance, the fighting men in the Temple burst out through the Nikanor Gates and attacked the Romans in the Court of the Women and the Court of the Gentiles. The Roman guards locked their shields together and tried to hold their ground, but the desperate attackers overran them. Titus saw the assault from where he watched on the tower of the Fortress Antonia and ordered a cavalry detachment to enter the fray. Mounted horsemen charged into the holy courts; their hooves clattered on the polished stone. The cavalry men briefly scattered the Zealots and fighters, but they quickly recovered themselves and continued the fight for the outer courts. The fight lasted through the morning until about the fifth hour of the day when the defenders finally retreated back into the Temple and closed the Nikanor Gates. Later in the afternoon, Roman soldiers took up positions in the Court of the Women—ostensibly to extinguish the fire burning in that courtyard. The defenders launched out from the Nikanor Gates, but this time the Romans put them immediately to flight and pursued them into the Temple’s inner courts. The fight moved around the altar, and around the Temple sanctuary. The Jews retreated into the safety of the Temple and the large buildings that flanked it on the four corners: the house of the hearth, the house of the treasury, the house of stone, and the chamber of hewn stone. Two soldiers contrived a way to smoke out their quarry. Standing on top of his fellow, a Roman soldier through a firebrand through a golden window on the second story of the house of the hearth. Soon smoke began to pour from the windows, and, presently, flames could be seen spreading through the outer chambers. Men, women, and children fled from the burning buildings. Word spread that the Temple was in flames. Roman soldiers came rushing from the Antonia and from the north gate, eager to lay their hands on the wealth. They trampled one another in their mad rush, and some fell into the flames as their comrades pushed from behind. While the Temple burned, the Roman soldiers plundered and looted. They captured and slew men, women, revolutionaries, common people, laymen, Levites, and priests. Ten thousand died. Those who surrendered received the same fate as those who fought on. The surviving fighting men fought hard to escape the Temple’s inner courts, and if they escaped to the outer courts, they met more soldiers. They struggled to fight their way to the city below. The remainder of the people fled to the only remaining shelters on the Temple Mount, Solomon’s Colonnade and the Royal Stoa. Some of the priests threw themselves into the flames consuming the Temple. The roar of the flames, the crash of collapsing buildings, the battle cry of the legions, the shouts of the revolutionaries, the clash of steel, the shrieks of women, the cries of children, and the lamentation of the people, all mingled into a terrible din which echoed off the hills and filled the city. Josephus says, “Perea also returned the echo,” reminding us of the believers in Pella who waited for news from the city. The height of the Temple’s buildings gave the billowing flames an immense elevation. One would have thought the whole city was on fire. It seemed as if the Temple Mount had erupted like a volcano. The telltale column of smoke was visible from many places throughout the land, and everyone understood at once. The people in the city below lamented and wailed. Even those who had been utterly silent and exhausted from starvation found the strength to cry out when they saw the Temple in flames. The dead lay strewn about, covering both the inner courts and the outer courts with their corpses. The Roman soldiers trampled over top of them, calling to mind the Master’s warnings to His generation, lest they become “no longer good for anything, except to be thrown out and trampled underfoot by men” (Matthew 5:13). Several thousand men, women, and children still cowered on top of Solomon’s Portico and the Royal Stoa. The Romans brought torches and pitch and ignited the portico roofs, paying back the Jews for the trick they had played on them. Many leaped from the pinnacle of the Temple into the valley below, the rest died in the flames. None who had taken refuge on the porticos survived. Adapted from: Torah Club: Chronicles of the Apostles, written by D. Thomas Lancaster.